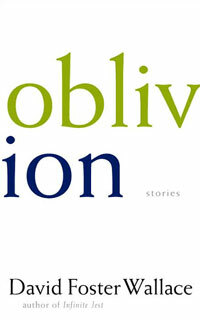 Oblivion was a very frustrating read for me. The writer has an interesting approach to writing that is not the traditional beginning, middle, and end to a story that we look for. There is no cohesive narrative in these works. His writing style is instead arranged in the way that thinking actually occurs. Rather than being presented with a story, it seems that a story is vaguely happening but what we are really being involved in is the characters thoughts while the event is unfolding, which may have nothing to do with the actual event occurring. Sentences can be pages and pages long while paragraphs are almost unheard of. While reading these stories I found myself lost in the character’s thoughts rather than being involved in the event itself. “Wallace has the right to write a great book that no one can read except people like him. I flatter myself to think that I am one of them, but I haven’t any idea how to convince you that you should be, too; nor, clearly, does Wallace. And it might not be the worst thing in the world, next time out, when big novel number three thumps into the world, were he has to dig deeper, search longer, and find a more generous way to make his feelings known.” From book review here. Except for, the unfortunate thing is that there will be no novel number three as David Foster Wallace committed suicide in 2008. When I first read this book, I did not know about his suicide and it was a shocking realization for me. While I can recognize his infinite brilliance as a writer, I can also see in his writing a lot of pain but it doesn’t feel like something that I can directly access as a reader. As one book review said: “Instead, it’s what we put between ourselves and those intolerable facts, the middle ground we make between mortification and oblivion.” I did not enjoy that middle ground and realized something about myself from reading this work. I think I like to feel like I transcend my pain and feel that something within me has changed because of trauma. Or I like to intensely, directly feel my pain with clarity, the thing itself, rather than indirectly being presented with trauma. I almost cannot bear to feel and read this dread while I do recognize its genius.